I have been quilting for almost 19 years now, I was 18 when I started. 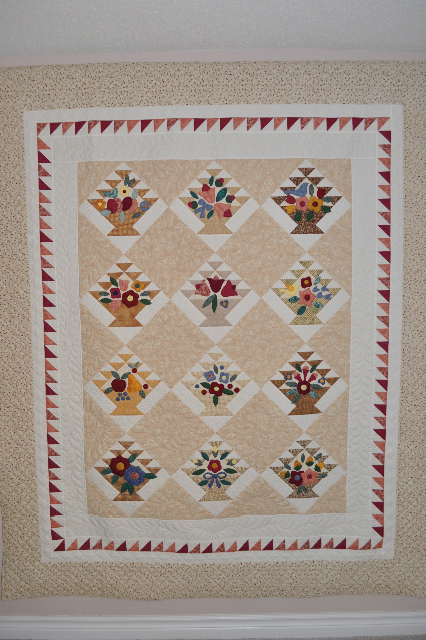 I am a fourth generation quilter. 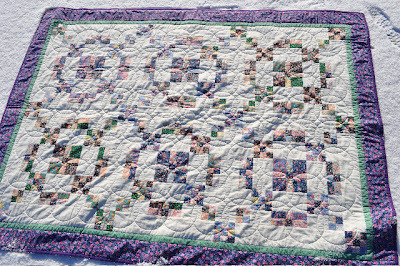 I grew up watching my mother and grandmother sew, knit, crochet, do needlwork and quilt. I did a lot of cross-stitch in high school, while my mom was teaching quilting classes and joined a quilting guild. I watched her quilt for a while and finally decided I wanted to give it a try. I asked her to find me an easy pattern and some fabric. She let me borrow all of her tools and taught me the proper way to use them. I made a scrappy crib sized quilt. I am not sure what the pattern was called, it was a mystery quilt from her guild. My mom and grandmother hand quilted my quilt for me using a margarine container lid as a stencil. 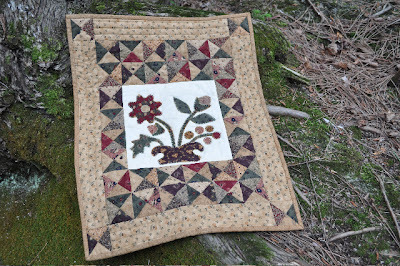 They weren't even done quilting that quilt, that I was making my second quilt, a log cabin wallhanging using 1 1/2" strips, that I machine quilted myself. I have been quilting ever since. I have grown quite a bit since then, sharing my passion with my mom and other quilting friends. I started my blog in September 2011. I needed a place to share my passion with others who love fabric and thread as much as I do. I have had lots of fun meeting other quilters. 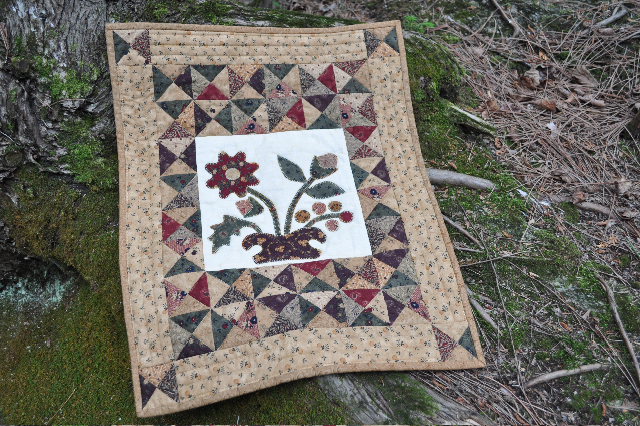 What a wonderful on-line quilting community we have! Although I do love seeing all of the new and modern quilting techniques, patterns and fabrics, I do consider myself a more traditional quilter. My favorite patterns are the Log Cabin and Dresden Plates. I do like playing with some of the more modern fabrics but my all-time favorite quilts are always scrappy! 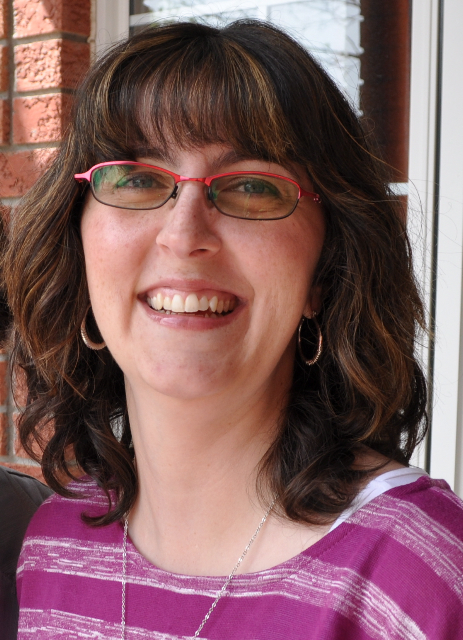 This year I am the challenge coordinator at The Common Thread Quilt Guild. http://www.commonthread.on.ca/ I had a blast in September and October convincing members to sign up for a box top challenge. I can't wait to see what they come up with! I love sharing my enthusiasm with others. I also have a Designer I embroidery machine and love making custom labels for quilts. I was asked to share with you my biggest dream. My biggest dream has always been to be a great mom and homemaker, to have healthy, thriving children who will succeed in whatever they choose to do. So far, so good! I must say that aside from that, I would love to start teaching quilting classes in the next year or two, and eventually would like to teach children too. Both my girls are already sewing and playing with fabric. I love all aspects of making a quilt, from picking the fabric, to machine piecing, machine or hand applique, machine quilting and binding. I have recently been bitten with the EPP bug too! If you follow my blog, you will see however that I have a LOT of UFOs and my favorite part of quilting is starting a new project! I hope you will join me and stop by my blog to see what project I am working on next! Thank you Monika and Rita for letting me share my quilting story.